A core element of AGCO’s mechanisation strategy for Africa is the AGCO Future farm initiative which provides farmers with education in core agricultural practices and trains operators, mechanics as well as local dealers on how to operate, service and maintain agricultural equipment. As part of this strategy, AGCO will break ground on a second Future Farm in Francophone Africa later this year. During today’s summit, AGCO signed a memorandum of understanding with CNFA (Cultivating New Frontiers in Agriculture), an international non-profit organization headquartered in Washington, D.C., that supports businesses, foundations, governments and communities to build customized local and global partnerships that meet the world’s growing demand for food. AGCO and CNFA will jointly promote agricultural mechanisation within Africa as a critical way to improve farm productivity and food security, particularly amongst smallholder farmers. “CNFA’s vision for Africa closely aligns with our own objective to develop sustainable and inclusive growth in agriculture and we look forward to working with them as a valued partner,” concluded Rob Smith. 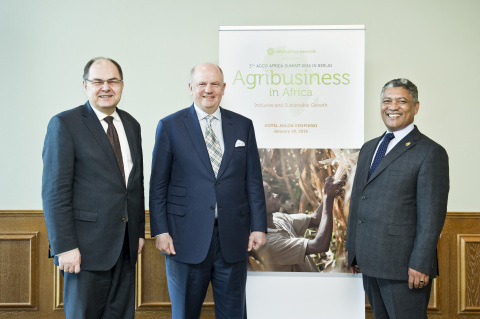 For more information, please visit http://agco-africa-summit.com/. AGCO (NYSE: AGCO) is a global leader in the design, manufacture and distribution of agricultural equipment. AGCO supports more productive farming through a full line of tractors, combines, hay tools, sprayers, forage equipment, grain storage and protein production systems, seeding and tillage implements and replacement parts. AGCO products are sold through five core equipment brands, Challenger®, Fendt®, GSI®, Massey Ferguson® and Valtra® and are distributed globally through a combination of approximately 3,100 independent dealers and distributors in more than 140 countries. Founded in 1990, AGCO is headquartered in Duluth, GA, USA. In 2014, AGCO had net sales of $9.7 billion. For more information, visit http://www.AGCOcorp.com. For company news, information and events, please follow us on Twitter: @AGCOCorp. For financial news on Twitter, please follow the hashtag #AGCOIR.